Blush Haus of Beauté: New Product Obsession Alert!!! Here at Blush Haus of Beaute, we have a lot of favorite products. 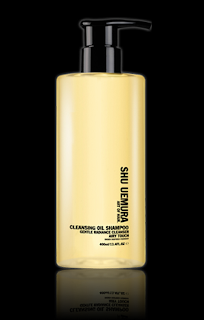 And it's no secret that the Shu Uemura line of haircare is amazing. But they've recently come out with a revolutionary new shampoo that has our heads spinning! 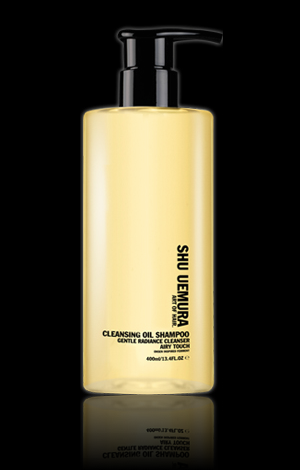 The Shu Uemura Cleansing Oil Shampoo is something that is truly unique in a world of perfectly paired shampoo's and conditioners. This Paraben and Silicone-free Shampoo is formulated from Deep-Sea Volcanic extracts to effectively draw out impurities without stripping hair of its natural oils to allow for easy detangling, weightless moisture, and brilliant shine. And the best part is, it's all you need! I must admit, I was really skeptical. I have really long, fine and damaged hair, and TONS of it. Usually a damage-repair shampoo and conditioner is all i can use, but even that gets too heavy and weighs it down. If I use anything that doesn't have enough moisture, I can't brush it and it looks and feels dry and dead. I certainly never thought I could go a day without using a conditioner. This Shampoo really changed everything. First of all, it's the best smelling shampoo I've ever come in contact with. I want it as a perfume... the fragrance is THAT amazing. The oil-to-foam formula lathers immediately to create a rich foam that breaks down product and oil buildup, leaving my scalp and locks squeaky clean (literally, you can hear it), yet rinses away to leave satin-soft tresses that detangle like a breeze. Once dry, my hair is weightless and bouncy, baby soft to the touch, and extremely shiny.... and hands-down the cleanest it's ever felt! And I'm not the only one who saw a difference. I've been getting compliments on my hair all day! Well, Ladies and Gentlemen, the great Shu Uemura has done it again.